I didn't sleep very well last night. Well actually I haven't slept well for about a week now. Last week, one of Mattie's playmates passed away. Her name was Sarah, and she was full of life. She had a beautiful smile, and I always thought her eyes were sparkling behind her oh-so-cute glasses. She and Mattie were the same age and have played along side each other at play group since they were probably younger than two. Sarah and Mattie were in different wards, so they were never as close as some of the other children were to Sarah. But, a little over a month ago, I received a call from Sarah's mother one Sunday night. Sarah had been asking to have a play date with Mattie. Mattie hasn't had very many play dates since she started school and is there four days of the week, so I was more than happy to have Sarah over to our house to play with Mattie. Sarah came over and she and Momo had a fabulous time together. They got along very well. One of the first things Mattie does when a friend is over is ask for a snack for them. Sarah made a point of telling me that she was not allowed to have sugar! I thought it was so funny, and I think it really told a lot about her sweet spirit. Seriously, what small child gives up the chance for sugar when they are away from their parents' watchful eye?! She and Mattie went right to work getting dressed up in princess clothes and setting up a store in the den. They pretended to shop until that got boring and decided that they needed to be the cashiers, and have somebody else come and shop at their store, (which they called "Target-Walmart"!) I got enlisted to be the shopper, and they took turns ringing up my purchases! I know that Mattie really had a great time doing that, because she still talks about it. I also found out Matt told them that our dog Gibbs likes to eat little princesses, especially if they are dressed in purple! Mattie told me this story last night, when I was talking to her about what was going to happen at the viewing and funeral. She said, "Sarah was in purple and I was in pink, but Daddy was just kidding with us, because Gibbs doesn't really eat people!" I really loved having Sarah in our home, and I had told Matt that she and Mattie played so well together, that I wanted to have her back over to play again. How saddened I am that we will not have that opportunity. On the other hand, I am extremely grateful for that recent one-on-one play date we did get. I think that my earliest memory of Sarah was from when she and Mattie were probably barely two and we were at a joint ward function. There was a chalkboard in the gym and both little girls really wanted to color on that chalkboard. The problem was there was only one small piece of chalk. Oh how they were fighting over that chalk! Sarah's mother Lydia came up to me and said that we should have the girls take turns sharing the chalk. I really admired Lydia as I watched her give each girl a fair amount of time coloring. Last Thursday, Matt and I took Mattie to her favorite place to go for ice cream. We sat together as a family outside on the picnic benches and told Mattie that we needed to have a very big kid discussion with her. She sat very still and listened intently as we told her that sometimes little children get sick and Heavenly Father calls them back home. We told her that Sarah had passed away. (That morning on the way to school, I had started preparing Mattie by playing a song called "Streets of Heaven". This song came out around the time Mattie was born. It tells of a mother's prayer to God, asking Him to hold the hand of her young daughter as she crosses the streets of heaven. I wanted Mattie to hear the words and understand that sometimes children get very sick. On the way to get ice cream she asked to listen to that song again, and then she asked me if there really are streets in heaven.) Mattie seemed to process the things we told her about death and life after death very well. We asked her what she could do for Sarah's parents to show them how sorry we were for their loss, and she told us that she would draw a picture of her and Sarah playing store. As we got up to leave and go home, Mattie started crying. I asked her what was wrong and she told me she was crying for Sarah. Her cries turned to hysterics on the way home. As I held her hand, I began to sob as well. I sobbed for the Gordon's loss of their precious daughter. I sobbed for the tender heart of my own young daughter. I sobbed for what seemed like such an unfair blessing of mine, to get to continue to be with my little ones. Mattie cried for awhile longer when we got home, but finally went to bed. In the days since last Thursday, she has continued to remember the passing of her friend, and has asked when she will get to go to the funeral to say good bye. And, that brings me to today. 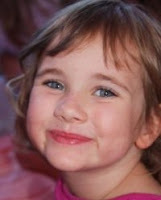 The funeral of little Sarah Gordon will be this afternoon. Mattie is at school right now, but I will be picking her up in just a few short hours. Last night she told me that she would like to go to the viewing and see Sarah, and she also told me that she would probably cry today. I know that this afternoon will be a very emotional one for many people, and as I laid in bed early this morning unable to sleep, my heart was full of gratitude. Gratitude for a loving Father in Heaven, who set up the perfect plan of salvation. A Father who sent His only Begotten Son to suffer and die for each of us, so that we may all have the opportunity to return home to Him again. I know, that precious little Sarah completed her mission in this life, and that she is a prefect little spirit that has been called back home to our Heavenly Father, and He has a special work for her to do. I also know with all of my heart that the Gordons will be reunited with their perfect little girl in the next life. Our prayers are with the Gordon family this day. Heather, this is such a beautiful but heartbreaking post. I hope you and everyone affected by Sarah's passing are comforted as you all go through this experience. I can't imagine how challenging this must be... my prayers will be with you guys. Wow, Heather... mom mentioned something about this...I am just catching up on blogging tonight. How touching your story was and the way you handled things with Mattie was so beautiful and perfect. What a crazy life lesson to learn so young.